We were expecting to have Sean Dunne’s statement of financial affairs today, but the request for a hearing earlier this week may indicate Sean will seek an extension or perhaps even some privacy. As of 2pm Dublin time, the statements haven’t been filed, but if they become available later today on the US court system PACER – subscription only and available to US citizens – they will be made available here. Meanwhile we do have one document that was filed yesterday and on the face of it, it is not an important document. It’s from the bankruptcy trustee to the bankruptcy court informing the court that it has mailed the so-called Rule 2004 application to Credit Suisse. This is the application for the subpoena which would compel Credit Suisse to submit itself to questioning by the bankruptcy trustee and also to disclose relevant documentation. However, what is noteworthy is that Credit Suisse has been given a copy of the subpoena application in New York and in Zurich, Switzerland. We know that Credit Suisse was involved in the Geneva apartment transaction whereby Gayle and Sean Dunne were parties to a purchase of a €4m apartment. 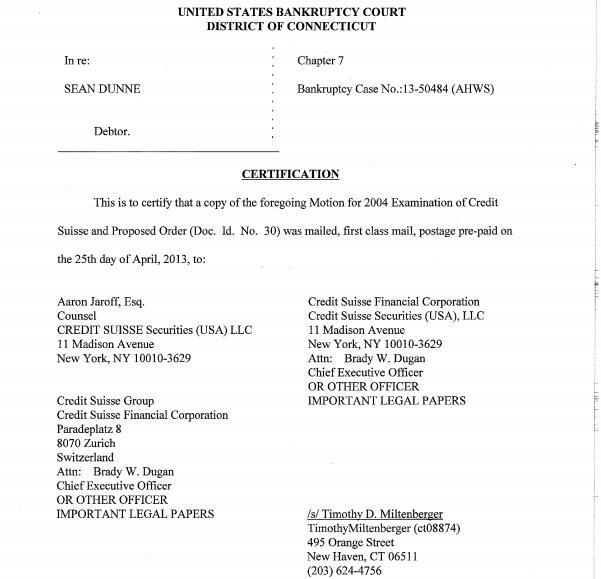 We don’t know if that is the reason the bankruptcy trustee wants to question Credit Suisse but the options here are limited, especially as Credit Suisse was not named as a creditor in Sean’s bankruptcy filing. Did IN&M just screw us big-time this morning? Independent News and Media finally published its annual report and accounts this morning, and at the same time, details of the planned restructuring of the group which will see its debt and pension liabilities rationalized. In Ireland, IN&M publishes the Irish Independent, Sunday Independent, Sunday World, Herald, Belfast Telegraph and Sunday Life plus a range of regional newspapers. Its biggest shareholder at 30% is Denis O’Brien. Billionaire Dermot Desmond and the O’Reilly family own a further 6% and 13% respectively. The group is of interest on here for two reasons. Firstly, it reportedly has loans of €150m from AIB and Bank of Ireland – €80m at the former and €70m at the latter. Overall, IN&M had loans of €440m at 31st December 2012. We own 99.8% of AIB and we own 15% of the ordinary shares in Bank of Ireland and have a further €1.5bn of preference shares in that bank. And the second reason is IN&M is the most powerful print media group in the country and its biggest shareholder is a controversial businessman against whom the Moriarty Tribunal has made adverse findings which Denis O’Brien rejects. The matter of greatest importance this morning was what was happening to the €440m of debt, though I should say the most surprising feature of the accounts here was that Irish revenues were down just 2% on 2011, from €363m to €355m, and that was an amazing and very impressive result, given the challenges to circulation and advertising. If you exclude exceptional items and pretend IN&M doesn’t have €121m of intangible assets, a massive pension deficit and excessive borrowing, its core business with operating profit of €60m and profit after tax of €29m doesn’t look too shabby. But what is happening to the loans from banks which we own? Having read the press release this morning several times, I am unclear. RTE had the opportunity of interviewing the CEO of IN&M, Vincent Crowley, this morning and amazingly didn’t ask. Apparently Vincent gave an interview on Newstalk where he talked about a €138m debt writedown and indeed the press release refers to “conversion/write down” of “€138m (after payment of €40m and equitisation of €10m of debt) plus any accrued PIK interest” Reading the last slide in the press release this morning, it seems to me the maximum gross writedown could be €196m plus interest comprising a €32m writedown in Facility A, a €50m writedown on Facility B, a €116m writedown on Facility C plus interest on the loans that stood at €440m at 31st December 2012. IN&M was asked for comment and the response for the time being is to refer to the last slide in the press release this morning and the €138m writedown. If the writedown is unclear, it is just as unclear what will happen to the different shareholdings in the company. The press release indicates that €40m will be provided to IN&M by its existing shareholders and that the banks will be given shares worth €10m or 11% of the company. Again this is unclear, and comment was sought from IN&M via its PR company. But on the face of it, it looks as if the banks may forgive or write-down or write-off up to €196m plus interest or 44c-plus in the euro and are getting 11% of a company which had a market value of €20m yesterday. Meanwhile existing shareholders whose company was worth €20m yesterday are investing a further €40m and will keep 89% of the company. If you take the IN&M statement at face value, the writedown is €138m and the banks will get shares worth €10m or 11% of the company. But whichever is correct, it looks like a lousy deal for the banks with AIB and BoI writing off €66m+, €150m/€440m * €196m+, and getting a 3.75% stake in the company in return (3.75% = €150m AIB and BoI loans/€440m total loans * 11% stake to be given to the banks). Last week’s Sunday Times Rich List ranked Denis O’Brien at position 2 in Ireland, with a fortune estimated at €4bn. If the above interpretation of the IN&M restructuring is correct, then I can see how Denis has come to be so wealthy, though I am scratching my head at why we still pay the Bank of Ireland CEO, Richie Boucher so much. When the history of the European financial crisis 2007-onwards is eventually written, it may transpire that the solution turned out to be the promise of a fantasy which never became reality. Last year, the ECB president Mario Draghi announced a scheme termed “Outright Monetary Transactions” which were advertised as the ECB buying the sovereign bonds of countries. At its heart, the promise conflicts with the ECB’s primary objective of keeping inflation at, or near, 2% per annum, because if the ECB buys bonds it is printing new money and that leads to inflation. But the world, and more importantly, the markets swallowed the promise/threat and since then, bond yields have steadily fallen as the perceived risk of default has receded with the ECB regarded as a buyer of last resort. This morning, one of the 17 central bank governors on the ECB’s governing council said “given that in the last few months we have had a kind of stabilisation, normalisation, maybe it [OMTs] will never be used” The governor of the Greek central bank, George Provopoulos was speaking in Athens today. In Ireland, we would like some clarity on OMTs because in six months, our friends in the bailout Troika will write their last cheque and given we still have a €10bn annual deficit, we will need someone to lend to us. We have built up a buffer in the national exchequer and we will be able to finance ourselves to the end of 2014 using present projections, but at that point, we’ll be riding the bike without stabilizers and the concern is that the market won’t lend to us at sustainable interest rates. So we would like the backstop of OMTs. Given we are exiting our bailout programme and that we have issued billions in long term bonds to a broad-based market in recent months, you would think we’re eligible for OMTs – those were the criteria stated by the ECB last year -but finance minister Michael Noonan keeps refusing to make that clear. He was again asked this week if Ireland now qualifies for OMTs and again he says it is in the gift of the ECB. It’s an unsatisfactory situation and means we remain uncertain about our funding when the Troika packs up and leaves. And with one ECB member expressing doubt that they’ll ever be used, are OMTs just a fantasy accepted by an otherwise-hardnosed market? The parliamentary question and answer are here. Deputy Pearse Doherty: To ask the Minister for Finance further to the European Central Bank press conference on 4 April 2013 in which the President of the ECB, Mr Mario Draghi, referred to OMTs and their precise rules, his views that the rules surrounding the criteria for access to the Outright Monetary Transaction scheme are precise; and if so, if he will confirm if the State meets the criteria for accessing funding under the OMT scheme at this time. Minister for Finance, Michael Noonan: As I informed the Deputy previously (Parliamentary Questions of 12th February 2013, (No. 211) and of 21st February 2013, (No’s 94 & 95)) the Governing Council of the ECB made a decision to establish the Outright Monetary Transaction (OMT) scheme on 2nd August 2012, and issued a press statement on 6th September 2012 which outlined its technical features. This press statement sets out that a necessary condition for OMT is strict and effective conditionality attached to an appropriate European Financial Stability Facility/European Stability Mechanism (EFSF/ESM) programme. Such programmes can take the form of a full EFSF/ESM macroeconomic adjustment programme or a precautionary programme (Enhanced Conditions Credit Line), provided that they include the possibility of EFSF/ESM primary market purchases. The ECB have also stated that OMT may also be considered for Member States currently under a macroeconomic adjustment programme “when they will be regaining bond market access”. The ECB press statement also notes that the ECB’s Governing Council will decide on the start, continuation and suspension of OMT, following a thorough assessment, in full discretion and acting in accordance with its monetary policy mandate. The decision on whether to grant OMT or otherwise in any particular case is therefore a matter for the ECB. I believe the ECB’s announcement regarding its OMT programme is a significant development and is viewed as such by the financial markets. We are now in the final year of our EU IMF programme and our focus is now firmly fixed on a successful and durable exit from the programme. The recent highly successful sale of long term bonds by NTMA is another very significant step in this process. We continue to assess a number of options in this regard. However, we must respect the fact that the decision on whether to grant OMT or otherwise in any particular case is a matter for the ECB, which is an independent body. As the regular audience on here knows, NAMA initially funded itself by issuing €32bn of bonds to buy €74bn of loans from the banks. In addition, NAMA received investment of €51m from three “independent” institutions and it received a loan of €49m from the Department of Finance which it has since repaid. In NAMA’s case, its initial funding from all sources was €32.1bn. A question often asked in certain circles is “what is NAMA’s cost of capital”. The “cost of capital” is what NAMA has to generate on its funding to cover its costs. The initial €30bn of NAMA’s funding carries an annual interest rate tied to ECB rates, specifically the 6-month Euribor rate which is presently about 0.3% per annum. NAMA has this week confirmed that its overall cost of funding is 1.5% which includes the cost of insuring against ECB interest rate increases. What is the relevance of NAMA’s cost of capital? In principle, if any developer comes to NAMA with a plan which will yield more than 1.5%, then it would enhance NAMA’s profit if that plan were pursued. It says something about how thick Irish developers must be, that they cannot come up with plans for their properties subject to NAMA loans that would yield more than 1.5% per annum. It is widely believed that US, UK and German investors are coming into Ireland chasing 20% annual returns, and yet our own lot can’t develop plans which would allow them go to NAMA and convince the Agency that it will get 1.5% per annum. So, what is NAMA doing? It is using its mountain of cash to redeem its bonds which cost it 1.5% per annum. Some people have antipathy towards developers for obtaining colossal loans during the boom, living the Life of Reilly during the good times and then presenting the bill to the State which took over the banks. I don’t, that’s business and it was a stupid decision by the State to take over the banks. But what I do resent is these geniuses can’t now devise plans which would generate wealth and jobs in the economy as well as give a return to us via NAMA over 1.5% per annum. Greed, pride, lack of foresight are one thing, not having the business smarts to deliver minimal returns is quite another. The parliamentary question and response which revealed NAMA’s rate of return are here. Deputy Pearse Doherty: To ask the Minister for Finance if he will confirm the approximate cost of capital at the National Asset Management Agency. Minister for Finance, Michael Noonan: I am advised by NAMA that its cost of capital is currently less than 1.5% per annum. NAMA has entered into interest rate hedging which acts as an insurance mechanism to hedge its interest expense against interest rates increases over its lifetime. NAMA’s cost of funds derives from both the interest cost on its debt securities and its hedging cost. NAMA’s cost of funds will vary over the lifetime of NAMA, depending on the mix of its liability base, the associated costs of these liabilities and its hedging strategy. Does this response to a parliamentary question look iffy to you? Anglo and Irish Nationwide have cost us €34bn so far, so the nation has a very large stake in ensuring that we get back as much of that money as possible now that the Irish Bank Resolution Corporation is being liquidated. Unfortunately, a curtain is being drawn across the liquidation and we should all be concerned at what is happening behind that curtain. Finance minister Michael Noonan has been refusing to provide information about IBRC for some time, he wouldn’t give us a breakdown of its legal costs, in fact last year, he wouldn’t even confirm its total legal costs, he refuses to provide us with the accounts for IBRC for the six months ending 31st December 2012 which means the most up-to-date accounts are for the first six months of 2012 and we believe that IBRC now has about €16bn of loans which it is presently valuing in advance of being offered for sale. We know that right now, borrowers at IBRC are trying to refinance loans and we were given to believe that borrowers refinancing their own loans would be paying IBRC 100% of the amount due. If borrowers were unable to refinance their loans, they were to be offered to the market and if they couldn’t fetch a minimum independently-valued price, they were to be transferred to NAMA. The Special Liquidator of IBRC is KPMG. Denis O’Brien and Paddy McKillen have recently been in the news because of injunctions they have sought to prevent the Sunday Times publishing information about them. Both are understood to be major IBRC borrowers with Paddy’s personal loans reported to be €300-370m and his corporate loans reported to be €550m and in April 2012, the Sunday Independent reported that Denis O’Brien’s loans at Anglo in 2009 were €833m but that these had fallen to “under €500m” in April 2012. This week in the Dail, Minister Noonan was asked to confirm the value of loans refinanced to date since the IBRC liquidation announcement on 6th February 2013 and to assure us that any loans refinanced were 100% repaid. The response from the Minister was that this information is commercially sensitive! But why should repeating a previous statement that loans would only be refinanced 100% be “commercially sensitive” unless borrowers were refinancing loans at less than 100%? And why would an overall total of refinancing in the 75 days be commercially sensitive? Does this look iffy to you? Deputy Pearse Doherty: To ask the Minister for Finance if he will confirm the value of loans at Irish Bank Resolution Corporation that have been refinanced out of IBRC between 6 February 2013 to date; and if he will confirm that in all cases, the refinancing was for 100% of the outstanding amount on the loan inclusive of all amounts due. Minister for Finance, Michael Noonan: I have been informed that the information requested is commercially sensitive and it would not be appropriate for the Special Liquidators to release such information.